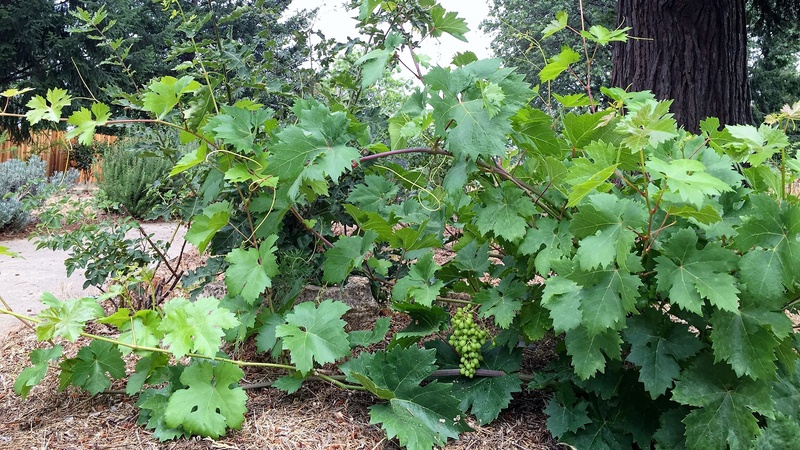 In midst of the apple orchards and vineyards that surround our neighboring home amidst came wild grapes that settled in our garden. Coincidentally, I also happen to LOVE dolmádes. 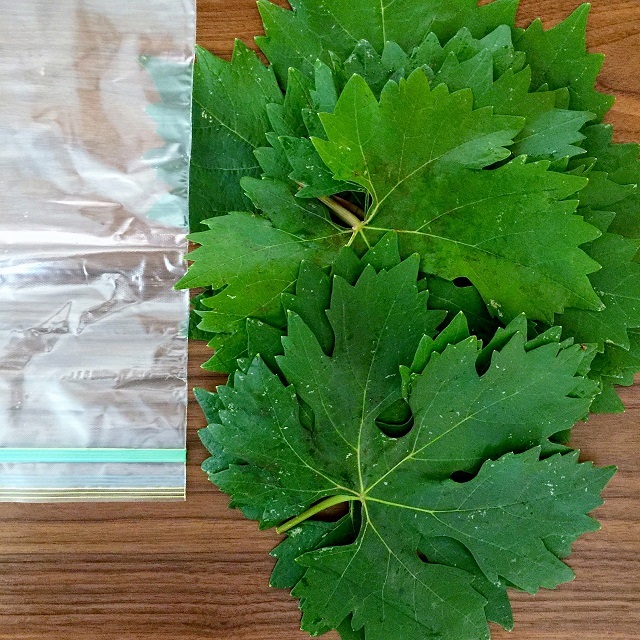 And so with grapes, comes grape leaves…thus, I seized the opportunity! 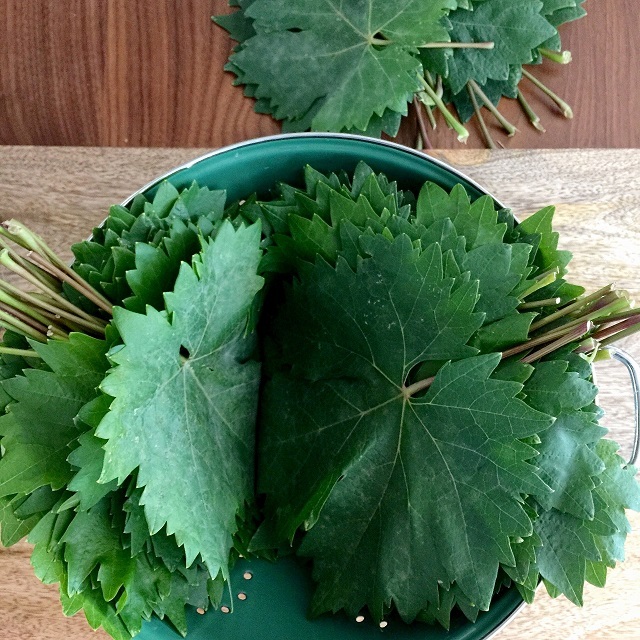 Original compilation for grape leaves preservation were adapted from various sources. 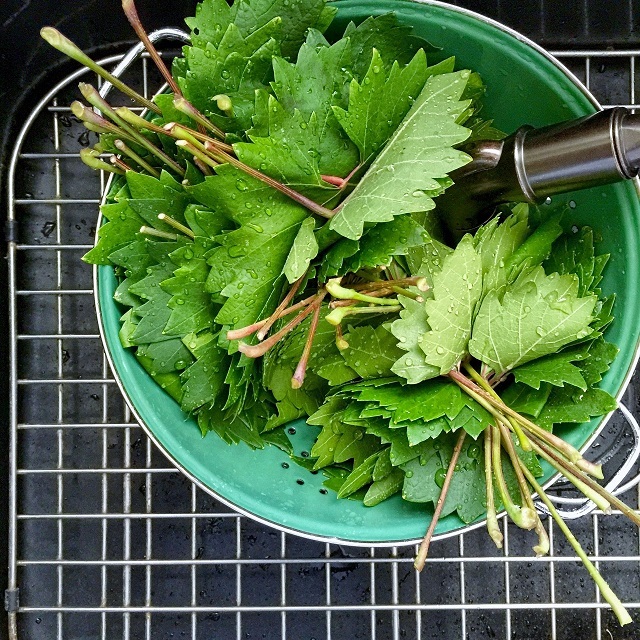 Rinse the leaves in a sink full of water and drain them, then repeat. 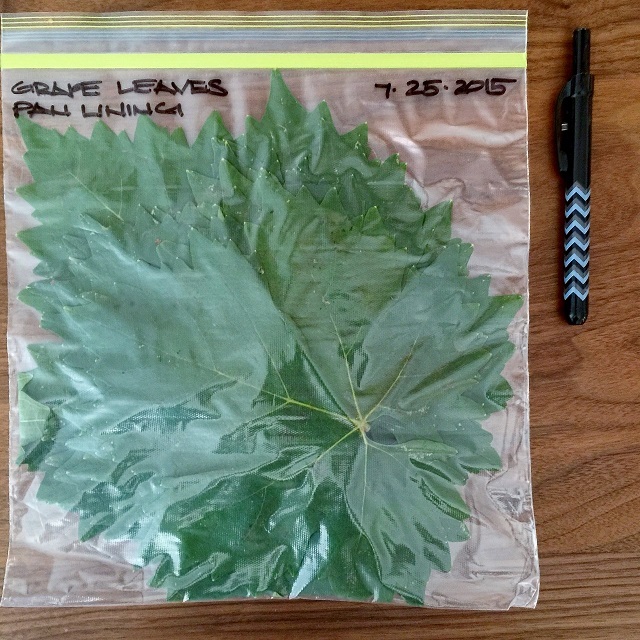 Make a stack of approximately 25 leaves. 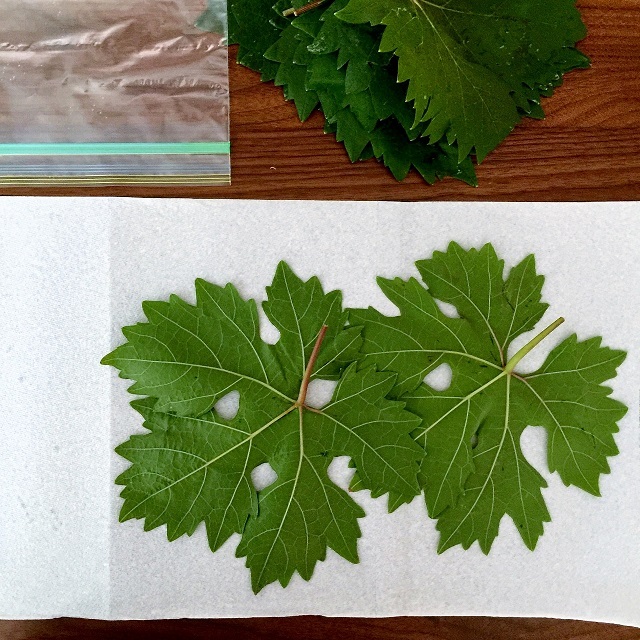 Place leaves vein side up on a cutting board. 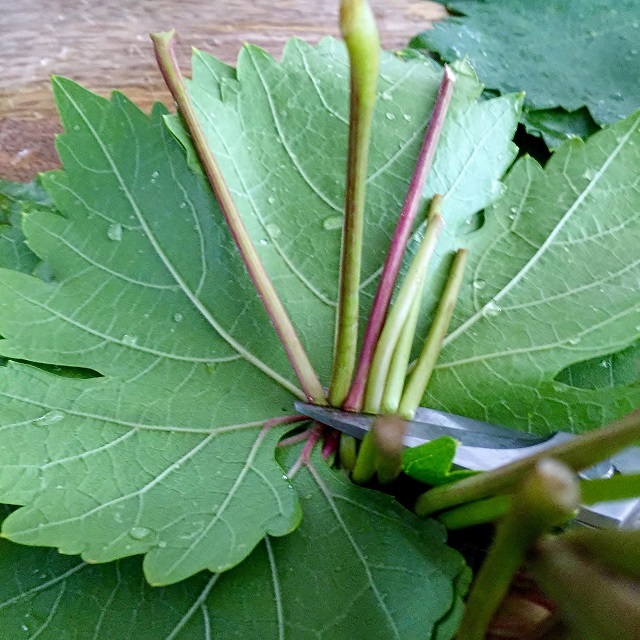 Trim the stem from the leaf. I found kitchen shears to be the best tool for this job. 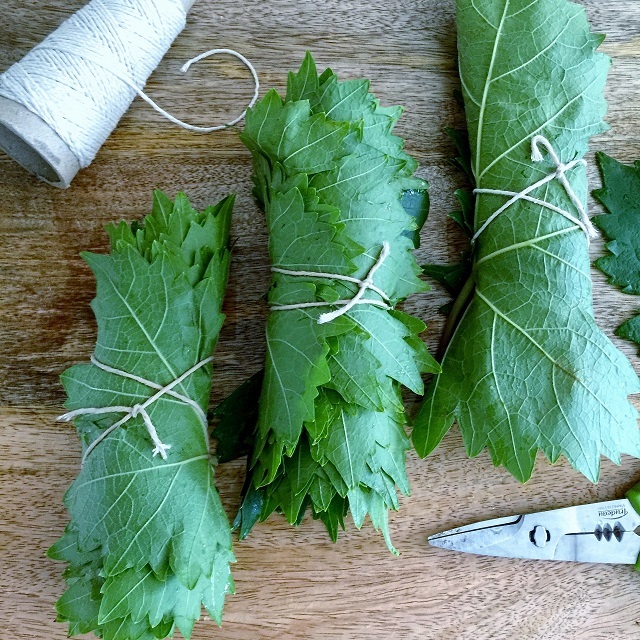 Roll the stack up and then tie it with string or sewing thread. Bring 1 quart water and salt to a boil. Blanch the leaves for 30 seconds. 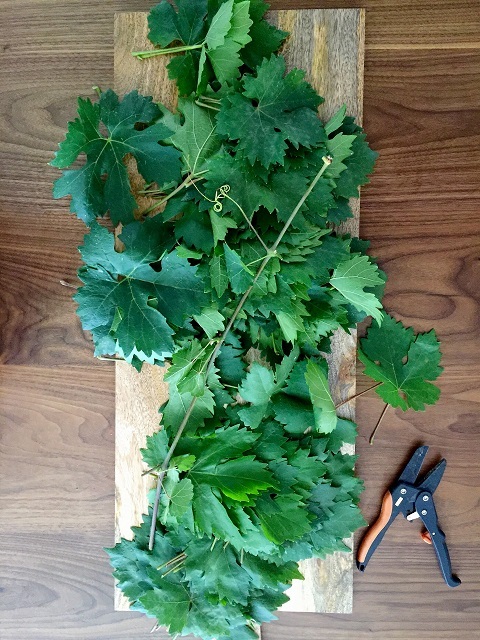 Remove leaves from pot with tongs or a slotted spoon taking care not to rip them. Allow to cool in a bowl with ice water. 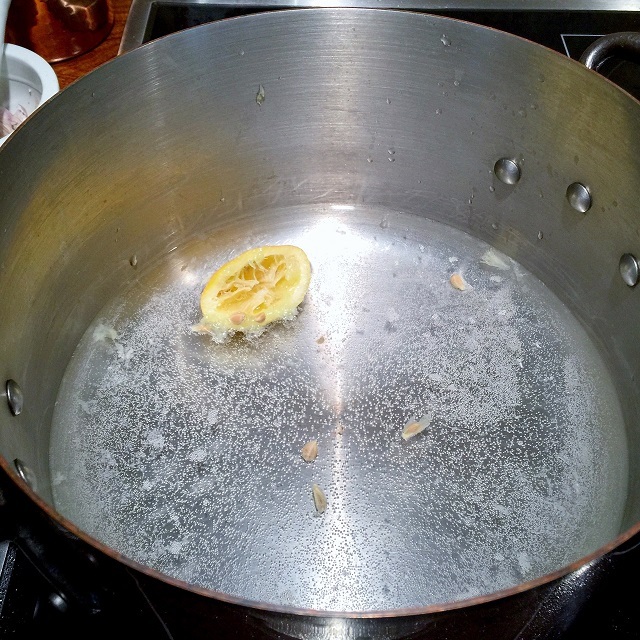 Bring water and lemon juice to a boil. Stack leaves in piles of 25 and roll up from side to side. 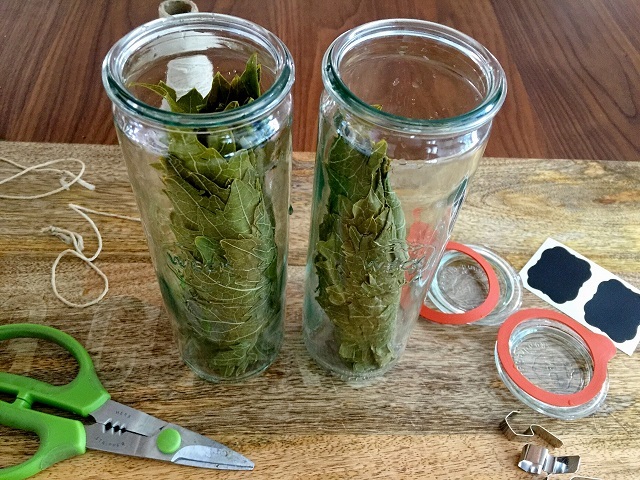 Place rolls upright in a sterile wide-mouth pint mason jar. Fold over tops to allow 1/2 head space. 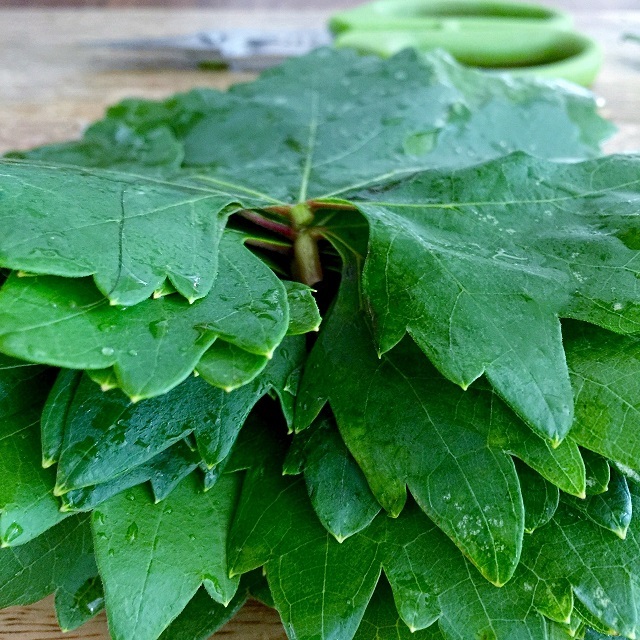 Pour hot water/lemon juice mixture over the leaves leaving a 1/2 inch head space. 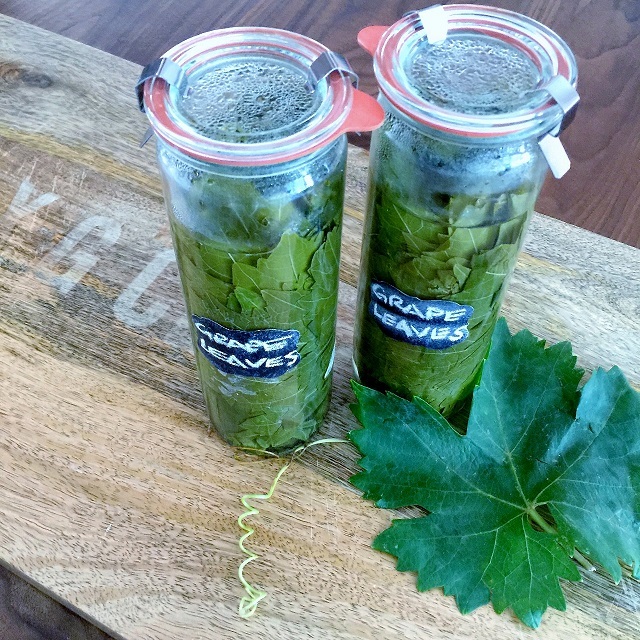 Wipe rim of jar with a clean towel. Top with a lid and screw down lid. 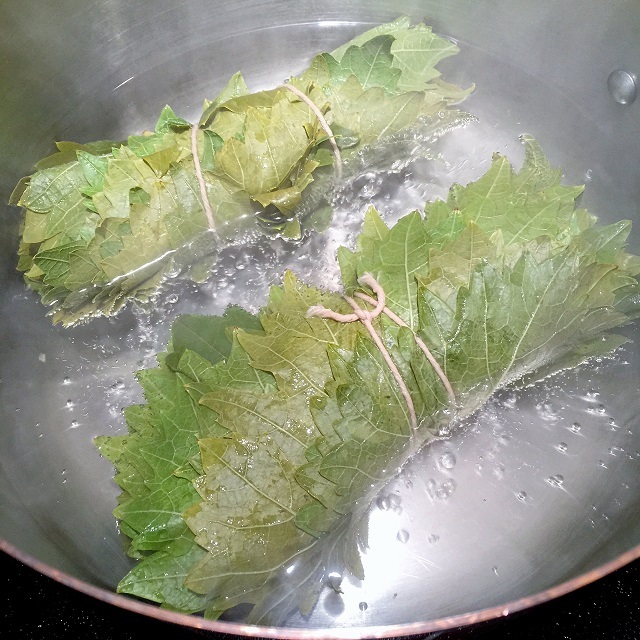 Process for 15 minutes in a boiling water bath or keep in the refrigerator. 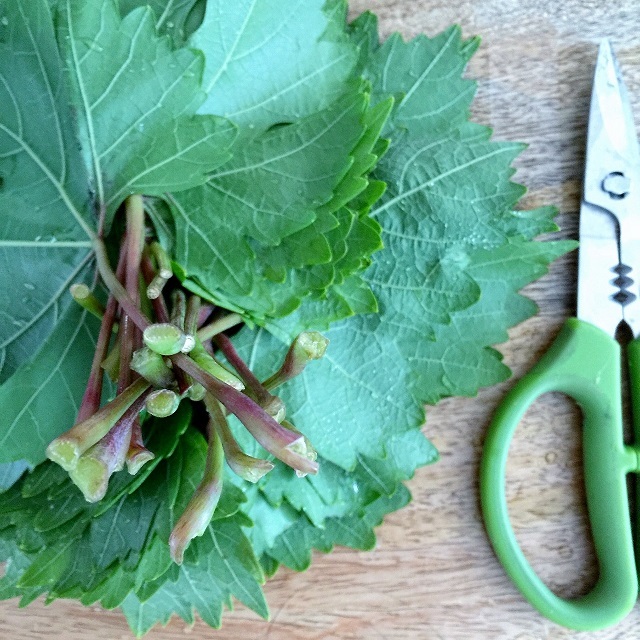 TIP: Save the bigger leaves, which may be too tough for stuffing, as the lining vessel for the pot/pan. 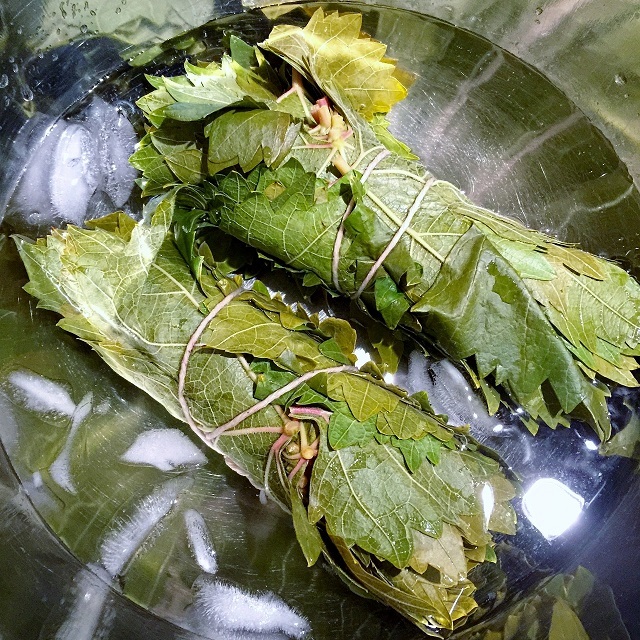 Wash them out, pat them dry, and place them in a freezer bag for later use. 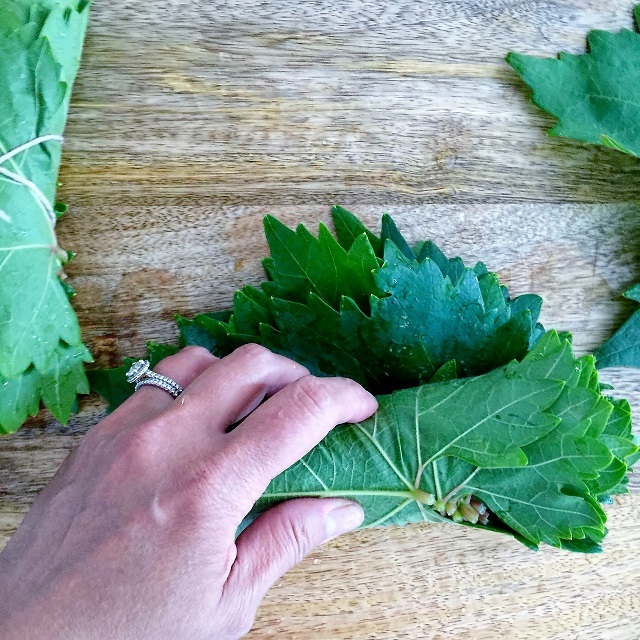 Posted in Jams/Preserves/Aigre-Doux, Menu and tagged agrarian, Grape leaves, Homesteading, recipes, rustic food, the cooking apprentice, vegetarian. Bookmark the permalink.